The Battle of the Dnieper was a military campaign that took place in 1943 on the Eastern Front of World War II. It was one of the largest operations in World War II, involving almost 4,000,000 troops at a time stretched on a 1,400 kilometres (870 mi) long front. During its four-month duration, the eastern bank of the Dnieper was recovered from German forces by five of the Red Army's fronts, which conducted several assault river crossings to establish several lodgements on the western bank. Subsequently, Kiev was liberated in the Battle of Kiev. 2,438 Red Army soldiers were awarded the Hero of the Soviet Union which was more than had been awarded previously since the award's establishment and never again was there such a large number of laureates. Following the Battle of Kursk, the Wehrmacht's Heer and supporting Luftwaffe forces in the southern Soviet Union were on the defensive in the southern Ukraine. By mid-August, Adolf Hitler understood that the forthcoming Soviet offensive could not be contained on the open steppe and ordered construction of a series of fortifications along the line of the Dnieper river. On the Soviet side, Joseph Stalin was determined to launch a major offensive in Ukraine. The main thrust of the offensive was in a southwesterly direction; the northern flank being largely stabilized, the southern flank rested on the Sea of Azov. The operation began on 26 August 1943. Divisions started to move on a 1,400-kilometer front that stretched between Smolensk and the Sea of Azov. Overall, the operation would be executed by 36 Combined Arms, four Tank and five Air Armies. 2,650,000 personnel were brought into the ranks for this massive operation. The operation would use 51,000 guns and mortars, 2,400 tanks and 2,850 planes. The Dnieper is the third largest river in Europe, behind only the Volga and the Danube. In its lower part, its width can easily reach three kilometres, and being dammed in several places made it even larger. Moreover, its western shore—the one still to be retaken—was much higher and steeper than the eastern, complicating the offensive even further. In addition, the opposite shore was transformed into a vast complex of defenses and fortifications held by the Wehrmacht. Faced with such a situation, the Soviet commanders had two options. The first would be to give themselves time to regroup their forces, find a weak point or two to exploit (not necessarily in the lower part of the Dnieper), stage a breakthrough and encircle the German defenders far in the rear, rendering the defence line unsupplied and next to useless (very much like the German Panzers bypassed the Maginot line in 1940). This option was supported by Marshal Zhukov and Deputy Chief of Staff A. I. Antonov, who considered the substantial losses after the fierce battle of Kursk. The second option would be to stage a massive assault without waiting, and force the Dnieper on a broad front. This option left no additional time for the German defenders, but would lead to much larger casualties than would a successful deep operation breakthrough. This second option was backed by Stalin due to the concern that the German "scorched earth" policy might devastate this region if the Red Army did not advance fast enough. Stavka (the Soviet high command) chose the second option. Instead of deep penetration and encirclement, the Soviet intended to make full use of partisan activities to intervene and disrupt Germany's supply route so that the Germans could not effectively send reinforcements or take away Soviet industrial facilities in the region. Stavka also paid high attention to the possible scorched earth activities of German forces with a view to preventing them by a rapid advance. The assault was staged on a 300-kilometer front almost simultaneously. All available means of transport were to be used to transport the attackers to the opposite shore, including small fishing boats and improvised rafts of barrels and trees (like the one in the photograph). The preparation of the crossing equipment was further complicated by the German scorched earth strategy with the total destruction of all boats and raft building material in the area. The crucial issue would obviously be heavy equipment. Without it, the bridgeheads would not stand for long. The order to construct the Dnieper defence complex, known as "Eastern Wall", was issued on 11 August 1943 and began to be immediately executed. Fortifications were erected along the length of the Dnieper. However, there was no hope of completing such an extensive defensive line in the short time available. Therefore, the completion of the "Eastern Wall" was not uniform in its density and depth of fortifications. Instead, they were concentrated in areas where a Soviet assault-crossing were most likely to be attempted, such as near Kremenchuk, Zaporizhia and Nikopol. Additionally, on 7 September 1943, the SS forces and the Wehrmacht received orders to implement a scorched earth policy, by stripping the areas they had to abandon of anything that could be used by the Soviet war effort. Despite a great superiority in numbers, the offensive was by no means easy. German opposition was ferocious and the fighting raged for every town and city. The Wehrmacht made extensive use of rear guards, leaving some troops in each city and on each hill, slowing down the Soviet offensive. Three weeks after the start of the offensive, and despite heavy losses on the Soviet side, it became clear that the Germans could not hope to contain the Soviet offensive in the flat, open terrain of the steppes, where the Red Army's numerical strength would prevail. Manstein asked for as many as 12 new divisions in the hope of containing the Soviet offensive – but German reserves were perilously thin. On 15 September 1943, Hitler ordered Army Group South to retreat to the Dnieper defence line. The battle for Poltava was especially bitter. The city was heavily fortified and its garrison well prepared. After a few inconclusive days that greatly slowed down the Soviet offensive, Marshal Konev decided to bypass the city and rush towards the Dnieper. After two days of violent urban warfare, the Poltava garrison was overcome. Towards the end of September 1943, Soviet forces reached the lower part of the Dnieper. Stavka detached the Central Front's 3rd Tank Army to the Voronezh Front to race the weakening Germans to the Dnieper, to save the wheat crop from the German scorched earth policy, and to achieve strategic or operational river bridgeheads before a German defence could stabilize there. The 3rd Tank Army, plunging headlong, reached the river on the night of 21–22 September and, on the 23rd, Soviet infantry forces crossed by swimming and by using makeshift rafts to secure small, fragile bridgeheads, opposed only by 120 German Cherkassy flak academy NCO candidates and the hard-pressed 19th Panzer Division Reconnaissance Battalion. Those forces were the only Germans within 60 km of the Dnieper loop. Only a heavy German air attack and a lack of bridging equipment kept Soviet heavy weaponry from crossing and expanding the bridgehead. The Soviets, sensing a critical juncture, ordered a hasty airborne corps assault to increase the size of the bridgehead before the Germans could counterattack. On the 21st, the Voronezh Front's 1st, 3rd and 5th Guards Airborne Brigades got the urgent call to secure, on the 23rd, a bridgehead perimeter 15 to 20 km wide and 30 km deep on the Dnieper loop between Kaniv and Rzhishchev, while Front elements forced the river. The arrival of personnel at the airfields was slow, necessitating, on the 23rd, a one-day delay and omission of 1st Brigade from the plan; consequent mission changes caused near chaos in command channels. Mission change orders finally got down to company commanders, on the 24th, just 15 minutes before their units, not yet provisioned with spades, anti-tank mines, or ponchos for the autumn night frosts, assembled on airfields. Owing to the weather, not all assigned aircraft had arrived at airfields on time (if at all). Further, most flight safety officers disallowed maximum loading of their aircraft. Given fewer aircraft (and lower than expected capacities), the master loading plan, ruined, was abandoned. Many radios and supplies got left behind. In the best case, it would take three lifts to deliver the two brigades. Units (still arriving by the over-taxed rail system), were loaded piecemeal onto returned aircraft, which were slow to refuel owing to the less-than-expected capacities of fuel trucks. Meanwhile, already-arrived troops changed planes, seeking earlier flights. Urgency and the fuel shortage prevented aerial assembly aloft. Most aircraft, as soon as they were loaded and fueled, flew in single file, instead of line abreast, to the dropping points. Assault waves became as intermingled as the units they carried. As corps elements made their flights, troops (half of whom had never jumped, except from training towers) were briefed on drop zones, assembly areas and objectives only poorly understood by platoon commanders still studying new orders. Meanwhile, Soviet aerial photography, suspended for several days by bad weather, had missed the strong reinforcement of the area, early that afternoon. Non-combat cargo pilots ferrying 3rd Brigade through drizzle expected no resistance beyond river pickets but, instead, were met by anti-aircraft fire and starshells from the 19th Panzer Division (only coincidentally transiting the drop zone, and just one of six divisions and other formations ordered, on the 21st, to fill the gap in front of the 3rd Tank Army). Lead aircraft, disgorging paratroopers over Dubari at 1930, came under fire from elements of the 73rd Panzer Grenadier Regiment and division staff of 19th Panzer Division. Some paratroops began returning fire and throwing grenades even before landing; trailing aircraft accelerated, climbed and evaded, dropping wide. Through the night, some pilots avoided starshell-lit drop points entirely, and 13 aircraft returned to airfields without having dropped at all. Intending a 10 by 14 km drop over largely undefended terrain, the Soviets instead achieved a 30 by 90 km drop over the fastest mobile elements of two German corps. On the ground, the Germans used white parachutes as beacons to hunt down and kill disorganized groups and to gather and destroy airdropped supplies. Supply bonfires, glowing embers, and multi-color starshells illuminated the battlefield. Captured documents gave the Germans enough knowledge of Soviet objectives to arrive at most of them before the disorganized paratroops. Back at the Soviet airfields, the fuel shortage allowed only 298 of 500 planned sorties, leaving corps anti-tank guns and 2,017 paratroops undelivered. Of 4,575 men dropped (seventy percent of the planned number, and just 1,525 from 5th Brigade), some 2,300 eventually assembled into 43 ad-hoc groups, with missions abandoned as hopeless, and spent most of their time seeking supplies not yet destroyed by the Germans. Others joined with the nine partisan groups operating in the area. About 230 made it over (or out of) the Dnieper to Front units (or were originally dropped there). Most of the rest were almost casually captured that first night or killed the next day (although, on that first night, the 3rd Co, 73rd Panzer Grenadier Regiment, suffered heavy losses while annihilating about 150 paratroopers near Grushevo, some 3 km west of Dubari). The Germans underestimated that 1,500 to 2,000 had dropped; they recorded 901 paratroops captured and killed in the first 24 hours. Thereafter, they largely ignored the Soviet paratroopers, to counterattack and truncate the Dnieper bridgeheads. The Germans deemed their anti-paratrooper operations completed by the 26th, although a modicum of opportunistic actions against garrisons, rail lines, and columns were conducted by remnants up to early November. For a lack of manpower to clear all areas, forests of the region would remain a minor threat. The Germans called the operation a fundamentally sound idea ruined by the dilettantism of planners lacking expert knowledge (but praised individual paratroops for their tenacity, bayonet skills and deft use of broken ground in the sparsely wooded northern region). Stavka deemed this second (and, ultimately, last) corps drop a complete failure; lessons they knew they had already learned from their winter offensive corps drop at Viazma had not stuck. They would never trust themselves to try it again. Soviet 5th Guards Airborne Brigade commander Sidorchuk, withdrawing to the forests south, eventually amassed a brigade-size command, half paratroops, half partisans; he obtained air supply, and assisted the 2nd Ukrainian Front over the Dnieper near Cherkassy to finally link up with Front forces on 15 November. After 13 more days combat, the airborne element was evacuated, ending a harrowing two months. More than sixty percent never returned. The first bridgehead on the Dnieper's western shore was established on 22 September 1943 at the confluence of the Dnieper and Pripyat rivers, in the northern part of the front. On 24 September, another bridgehead was created near Dniprodzerzhynsk, another on 25 September near Dnipropetrovsk and yet another on 28 September near Kremenchuk. By the end of the month, 23 bridgeheads were created on the western side, some of them 10 kilometers wide and 1-2 kilometres deep. The crossing of the Dnieper was extremely difficult. Soldiers used every available floating device to cross the river, under heavy German fire and taking heavy losses. Once across, Soviet troops had to dig themselves into the clay ravines composing the Dnieper's western bank. German troops soon launched heavy counterattacks on almost every bridgehead, hoping to annihilate them before heavy equipment could be transported across the river. For instance, the Borodaevsk lodgement, mentioned by Marshal Konev in his memoirs, came under heavy armored attack and air assault. Bombers attacked both the lodgement and the reinforcements crossing the river. Konev complained at once about a lack of organization of Soviet air support, set up air patrols to prevent bombers from approaching the lodgements and ordered forward more artillery to counter tank attacks from the opposite shore. When Soviet aviation became more organized and hundreds of guns and Katyusha rocket launchers began firing, the situation started to improve and the bridgehead was eventually preserved. Such battles were commonplace on every lodgement. Although all the lodgements were held, losses were terrible – at the beginning of October, most divisions were at only 25 to 50% of their nominal strength. By mid-October, the forces accumulated on the lower Dnieper bridgeheads were strong enough to stage a first massive attack to definitely secure the river's western shore in the southern part of the front. Therefore, a vigorous attack was staged on the Kremenchuk-Dnipropetrovsk line. Simultaneously, a major diversion was conducted in the south to draw German forces away both from the Lower Dnieper and from Kiev. At the end of the offensive, Soviet forces controlled a bridgehead 300 kilometers wide and up to 80 kilometers deep in some places. In the south, the Crimea was now cut off from the rest of the German forces. Any hope of stopping the Red Army on the Dnieper's east bank was lost. The Battle of the Dnieper was another defeat for a Wehrmacht that required it to restabilize the front further West. The Red Army, which Hitler hoped to contain at the Dnieper, forced the Wehrmacht's defences. Kiev was recaptured and German troops lacked the forces to annihilate Soviet troops on the Lower Dnieper bridgeheads. The west bank was still in German hands for the most part, but both sides knew that it would not last for long. Additionally, the Battle of the Dnieper demonstrated the strength of the Soviet partisan movement. The "rail war" operation staged during September and October 1943 struck German logistics very hard, creating heavy supply issues. Incidentally, between 28 November and 1 December 1943 the Teheran conference was held between Winston Churchill, Franklin D. Roosevelt, and Stalin. The Battle of the Dnieper, along with other major offensives staged in 1943, certainly gave Stalin a dominant position for negotiating with his Allies. 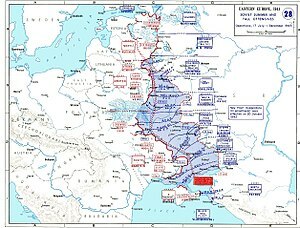 From a Soviet operational point of view, the battle was broken down into a number of different phases and offensives. ^ a b c d Frieser et al. 2007, p. 343. ^ 1943 Dnepr airborne operation: lessons and conclusions Military Thought, July 2003, by Nikolai Viktorovich Staskov. (online) See ref at Army (Soviet Army) under 40th Army entry. Marshal Konev, Notes of a front commander, Science, Moscow, 1972. Erich von Manstein, Lost Victories, Moscow, 1957. Operation Bagration was the codename for the Soviet 1944 Belorussian Strategic Offensive Operation, a military campaign fought between 23 June and 19 August 1944 in Soviet Byelorussia in the Eastern Front of World War II. The Soviet Union inflicted the biggest defeat in German military history by destroying 28 out of 34 divisions of Army Group Centre and completely shattered the German front line. The 3rd Guards Army was a field army of the Soviet Red Army that fought on the Eastern Front in World War II. The Second Battle of Kiev was part of much wider Soviet offensive in Ukraine known as the Battle of the Dnieper involved three strategic operations by the Soviet Red Army, and one operational counterattack by the Wehrmacht which took place between 3 October and 22 December 1943. 3rd Ukrainian Front was a Front of the Red Army during World War II. The Dnieper–Carpathian Offensive, also known in Soviet historical sources as the liberation of right-bank Ukraine, fought from 24 December 1943 – 17 April 1944, was a strategic offensive executed by the 1st, 2nd, 3rd, and 4th Ukrainian Fronts, along with the 1st Belorussian Front, against the German Army Group South, intended to retake all of the Ukrainian and Moldovian territories occupied by Axis forces. The Zhytomyr–Berdychiv Offensive operation was a part of the strategic offensive of the Red Army in the right-bank (western) Ukrainian SSR, the Dnieper–Carpathian Offensive. The offensive operation was conducted by the forces of the 1st Ukrainian Front commanded by General of Army Nikolai Vatutin during World War II, from 24 December through to 14 January 1944. The 111th Infantry Division was a major unit of the German Wehrmacht. Formed in late 1940 in the further expansion of the German army it was committed to the campaign against Russian, and spent 3 years on the eastern front. The division was finally trapped in the Crimea and destroyed in the spring of 1944. The Nikopol–Krivoi Rog Offensive was an offensive by the Red Army's 3rd Ukrainian Front and elements of the 4th Ukrainian Front against the German 6th Army in the area of Nikopol and Krivoi Rog in Dnipropetrovsk Oblast in central Ukraine between 30 January and 29 February 1944. It took place on the Eastern Front of World War II and was part of the wider Dnieper–Carpathian Offensive, a Soviet attack against Army Group South to retake the rest of Ukraine that fell to Germany in 1941.